What can Serial teach us? How to think. Suellen and I just drove 1,100 miles to visit Grandma for the holidays. 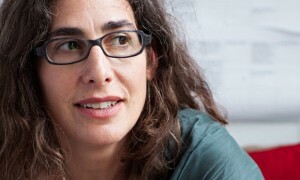 Along the way, we listened to the 12 episodes of the podcast, Serial, created by the journalist Sarah Koenig (pictured). Serial focuses on the murder of Hae-Min Lee, a high school senior who disappeared in Baltimore in January 1999. Hae’s ex-boyfriend, Adnan Syed, was convicted of murder and is now serving a life sentence. Adnan’s trial revolved around: 1) testimony from Jay Wilds, a high school student and small-time dope dealer who admitted to helping dispose of Hae’s body, and ; 2) cell phone records that noted the time and rough location of numerous calls between various students. Shortly before she disappeared, Hae broke up with Adnan and started dating Don, a slightly older boy who worked at a local mall. When Hae’s body was discovered (under unusual circumstances), both Don and Adnan came under suspicion. Don had a good alibi, however, and Adnan did not. Jay’s testimony pointed at Adnan. Some of the cell phone records supported Jay’s story but others contradicted it. Adnan has consistently maintained his innocence. Throughout the 12 episodes, Koenig tries to chase down loose ends and unanswered questions. She interviews everyone, including Adnan, multiple times. The case seemed pretty solid at first. Indeed, the jury deliberated only a few hours before returning a guilty verdict. Under Koenig’s relentless scrutiny however, doubts begin to emerge. Could Adnan really have done it? Maybe. Maybe not. I won’t give away the ending, but Serial is a fascinating look at police investigations and our criminal justice system. For me, it’s also a fascinating way to teach critical thinking. Here are a few of the critical thinking concepts (and biases) that I noted. Confirmation bias – Adnan notes that the prosecution only presented the cell phone evidence that supported Jay’s version of events. They ignored any cell record that contradicted Jay. That’s a pretty good example of confirmation bias – selecting the evidence based on what you already believe. Stereotyping – Adnan is an American citizen who is also a Muslim of Pakistani heritage. Many Americans have heard that Muslim men can take multiple wives and that “honor killings” are still practiced in Pakistan. This seems to give Adnan a motive for killing Hae. But is it true or is it just a stereotype? Projection bias – as we listen to the program, we might say, “Well, if I were going to kill someone, I wouldn’t do it that way. It’s not a smart way to commit murder. So maybe he didn’t do it.” But, then, what is smart about murder? On the other hand, Adnan comes across as smart, articulate, and resigned to his fate. We might project these feelings: “If I were wrongly convicted of murder, I would be angry and bitter. Since Adnan is neither, perhaps he really did do it”. Our projections could go either way. But note that our projections are really about us, not about Adnan. They tell us nothing about what really happened. To get to the truth, we have to ignore how we would do it. Are there other critical thinking lessons in Serial? Probably. Listen to it and see what you think. I’m not sure I agree with Koenig’s conclusions but I sure love the way she led us there.